PORT MORESBY: The Papua New Guinea's successful hosting of the international events has been attributed to the government’s investment backed by the corporate sponsors according to a State Minister. In his first official address today to a breakfast in Parliament’s State Function Room, honorable William Samb, the Minister Assisting the Prime Minister in Affairs of Bougainville and Sports, none of the major events staged would have taken place without this support. He was appointed on May 9, 2018. 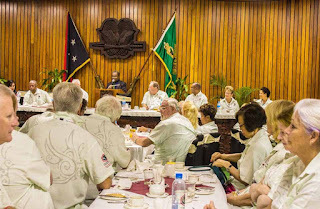 “Just like our business houses, our government led by Prime Minister Peter O’ Neill recognizes the importance of sport and its role in the community,” he told the breakfast attended by members of Carbine International Congress whose main focus is on sports development. On behalf of the Prime Minister Peter O’ Neill and his government, Mr Samb commended them for this. He stepped in for PM O’Neill who is away in the Philippines on official engagement. “It is wonderful to know that we have like-minded executives working here in PNG, many of whom have lived here a long time that give so much of their time and funds to supporting sport. “This support ranges from junior development to international representation,” he said. He said the government invested over K1 billion to host the 9th South Pacific Game at facilities that are world class. “I am glad to hear that today you will watch our SP Hunters team play at the new Oil Search National Football Stadium that was completed through a tax credit scheme. I am sure you will have a great afternoon. All the investment by the Government and supported by the private sector is beginning to pay off,” he said. In recent years here are some of our highlights. According to him, Papua New Guinea has also recently hosted the PGA Golf Open in Port Moresby where over 70 International Golfers contested a prize pool of a$150,0000. “I am also pleased to note our own PNG Amateur Brain Tikiri finished in the top five scorers. “We also saw more than 250 Anglers fight out the 2018 National Game Fishing tittles which also attracts significant sponsorship from the Private Sector,” he said. PNG, he said, is a popular destination at this time as this year the country is hosting APEC which involves a number of meetings through the year which will culminate in Leaders Week in November when the leaders of the 21 Economies of APEC will be here in Port Moresby. “I am sure you will agree with me this is a fantastic opportunity to promote PNG as a destination to invest and do business,” he said. Minister Samb addressing a breakfast at the State Function Room of Parliament in Port Moresby .